So far we’ve finished covering up the Central Nervous System. All we need to do now is cover the Peripheral Nervous System. Great! The good news though is that we can go over all this much more faster than the CNS. 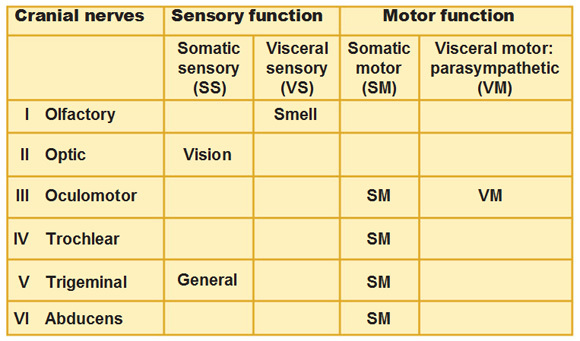 Sensory receptors pick up stimuli from inside or outside the body. Nerves and ganglia: Nerves are bundles of peripheral axons. Ganglia are clusters of peripheral neuronal cell bodies. 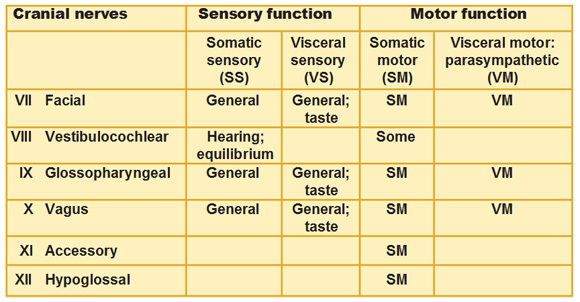 Somatic sensory system are widely spread throughout the body that deal with touch, pain, vibration, pressure, temperature, proprioception, hearing, balance and vision. 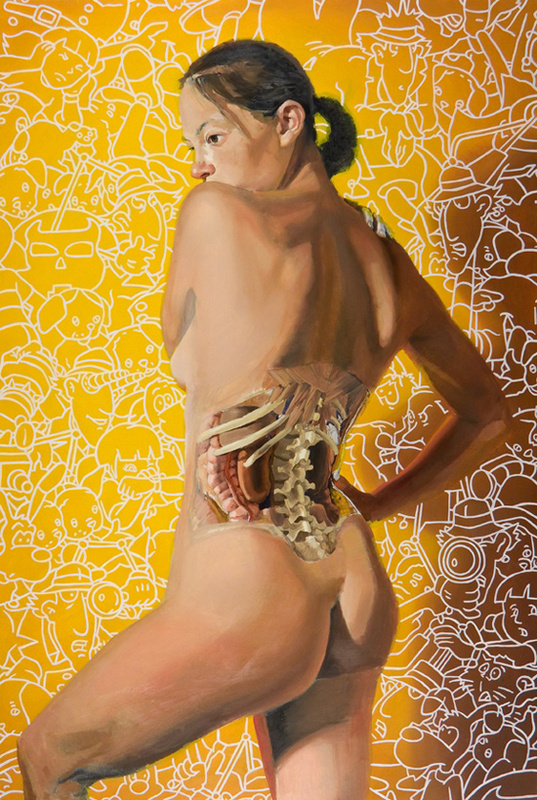 Visceral sensory system deals with stretching, pain, temperature, nausea, hunger, taste and smell. Visceral motor system deals with the involuntary contraction of smooth and cardiac muscle. This includes the sympathetic division (fight or flight) and parasympathetic division (rest and digest) which include the autonomic nervous system. 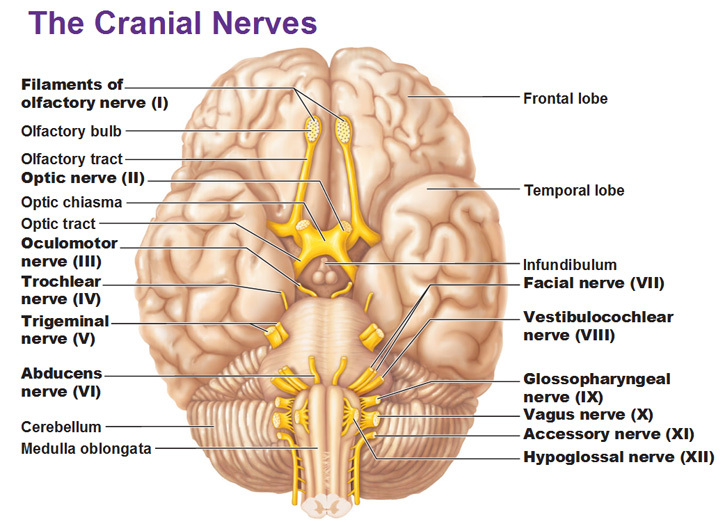 Cranial nerves attach to/originate from the brain and pass through various foramina of the skull. They are numbered from I-XII. Cranial nerves I and II attach to the forebrain (front of cerebral hemispheres). All the others attach to the brain stem. They primarily serve the head and neck structures. 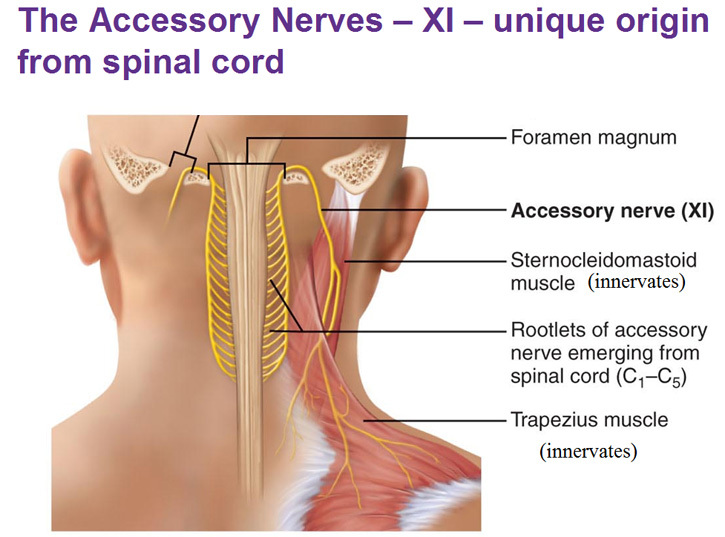 The Vagus Nerve (X) extends into the thorax and abdomen. Notice the use of roman numerals? You have to know them if you don’t already. All right so let’s go through this chart, we’ll start with the olfactory nerve. The odor molecules come into the nose and the filaments of the olfactory nerve pick this up. You could see in the picture below that little pea sized thing that is sitting inside something, what is that called? The sella turcica. 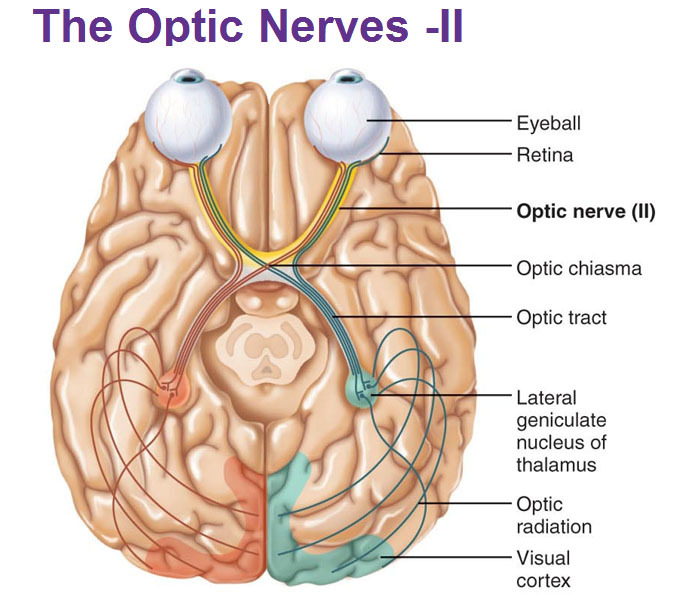 The optic nerves are just the sensory nerves of vision. They lead up to the optic chiasma (crossing) and carry information all the way to the occipital lobe. Oculomotor (III), Trochlear (IV) and Abducens (VI) nerves can be grouped together because these are all the ones that move your eye ball. So remember, 3, 4 and 6 (skip 5) all innervate the muscles that move your eyeballs. 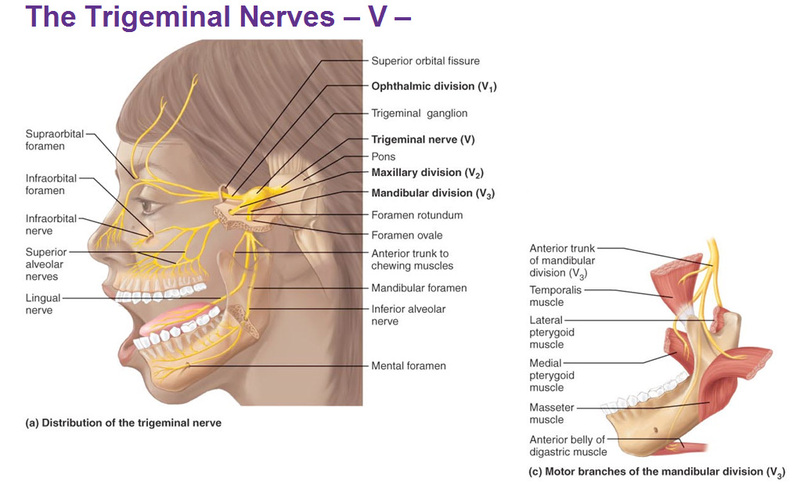 The trigeminal nerve V splits into 3 major branches after the trigeminal ganglion and has the ophthalmic, maxillary and mandibular divisions. The motor function is for the muscles of mastication. The sensory function is for the face as well as for the gums and teeth. Dentists inject anesthetic into branches of this nerve to numb the gums and teeth. During a root canal it’s these nerves that are removed. 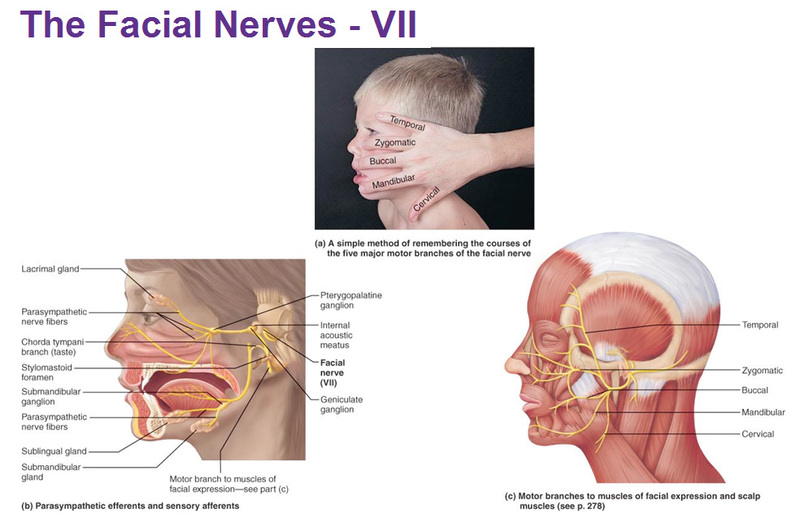 The facial nerves innervate the muscles of facial expression. An easy way to remember what the 5 branches of this nerve are called is to put your hand over the face and it correlates to the same muscles. 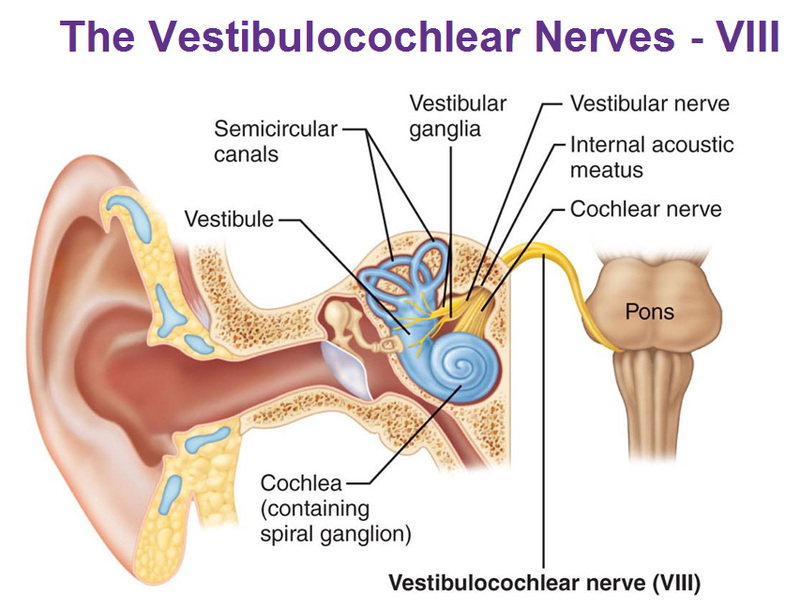 The vestibulocochlear nerve is the sensory nerve of hearing and balance. The vestibular apparatus (cochlea) is in blue. The coiled up part is the hearing part, protected by bone. 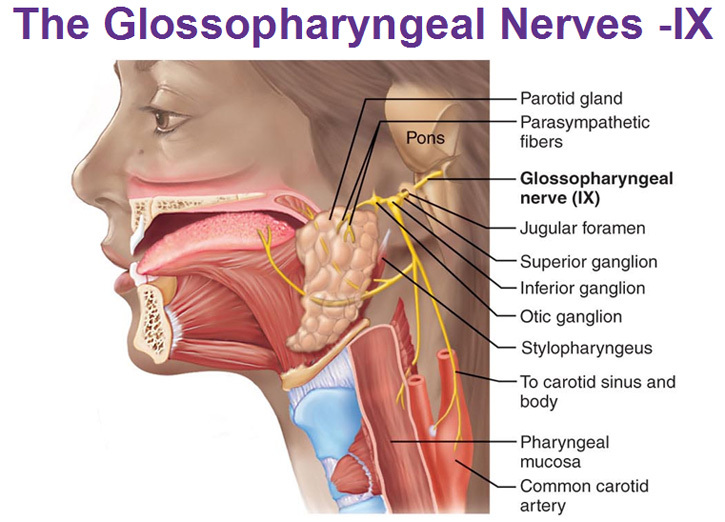 The glossophargyngeal nerve innervates structures of the tongue (glosso) and pharynx (pharyngeal=swallow) and provides somatic motor and taste, respectively. It also innervates O2 and CO2 chemoreceptors in the carotid body and blood pressure sensor baroreceptors in the carotid sinus to provide its visceral sensory function. 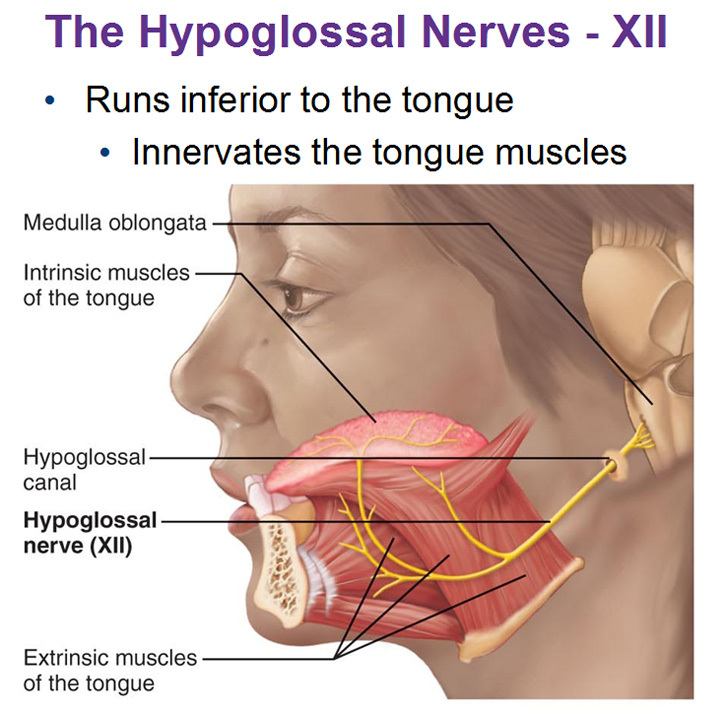 Its visceral motor function is salivation through the parotid gland. 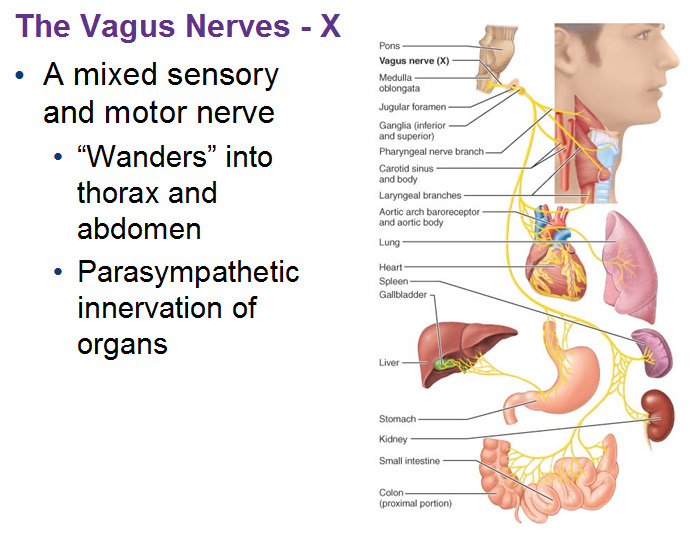 The vagus nerve is in the parasympathetic system (rest & digest). Maybe it’s called accessory cause it looks like an accessory? Like some sort of thing that hangs from your head.